This last salad in our series of traditional salads, is one I created when my husband suggested we have Caesar salad (again). I considered how to slip a change into the typical chicken Caesar without losing the simplicity of this satisfying meal. A touch of sesame oil and toasted almonds instead of croutons add just a hint of Asian. And fresh spinach with traditional romaine adds a twist. Now this variation is a standby quick-meal at my house. Let me know if this recipe becomes a regular on your menu! For even, quick cooking, slice chicken breasts horizontally to ½-inch thickness, or flatten with palm of hand or a meat mallet. (Or, purchase chicken tenders). Combine panko crumbs, sesame seeds and salt in a clean plastic bag. Add chicken to the bag; toss and press until crumbs evenly coat chicken. Heat oil in a nonstick skillet over medium-high heat. Add chicken; cook, turning once until well-browned and internal temperature is 170°F, about 5 minutes per side. Slice into ½-inch strips. Meanwhile, stir together salad dressing and sesame oil. 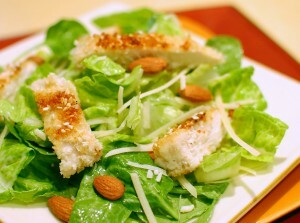 In a large bowl, toss dressing with lettuce and spinach, almonds and Parmesan. Serve salad topped with sliced chicken and additional Parmesan if desired. I usually prefer homemade salad dressings, but Johnny’s Great Caesar! regular or Lite! pass my taste test with high marks, and the sesame oil blends without being too oily. Johnny’s is available at grocery stores or Costco. Asian type sesame oils are usually called dark or toasted, and used as a flavoring condiment to add roasty-nutty notes. If the oil is very light colored it probably won’t have the distinctive flavor that highlights this recipe. Look for dark sesame oil in the Asian section of the supermarket. Sesame oil and sesame seeds go rancid quickly if stored at room temperature. To keep fresh, store sesame oil in the refrigerator and seeds in the freezer. Can I bake the chicken instead and serve it with the light dressing? Always trying to keep the calories and fat content down. Dianne -I tested baking the chicken instead of pan-frying. It doesn’t turn out as crispy and brown, even with a little olive oil rub before coating. Try using a scant tablespoon of oil to cook the chicken, and definitely try the light dressing to save calories. Just the colors in your photos make me want to try your recipes! Have done some things like you when we’ve been sailing on Jammin’ with what’s in our galley- especially with canned tuna fish, spinach, other veggies & spices so I really enjoy comparing recipes for a change of ….. course. We just did a car trip where we ate out TOO much and we are both eager to get in our kitchen again! Am looking for low sodium ingredients for salad dressings too. Any ideas? Am making my own bread crumbs now. And prefer to make from scratch rather than use high sodium soups etc..
Kaete – for low-sodium salad dressings, best to stick with homemade. You might try a dash of low sodium soy sauce with unseasoned rice vinegar and a mild oil. Sesame seeds would be a nice addition to this salad too! Wow, healthy salad. Loved it. I’ve browsed your other recipe and all were all pretty easy to prepare. Thanks Jeff. We hope you try other recipes and like them too! Pingback: Salad Dressings -- homemade or store bought?